My journey to discovering how creative expression can help heal and maintain overall well-being, began when I was a child. All my life I have been surrounded by art, for my mother was an artist. By trade she was a graphic artist, directing an art department in a small ad agency, but in her free time she engaged in all forms of sketching, drawing, and painting. Our home always had an art table in which the tools of the trade; markers, pencils, erasers, rulers, paint, and the like were at the ready. I have always found a sense of calmness and balance around that art table, and when having a bad day, nothing would improve my outlook or attitude more than wrapping my fingers around a crayon or marker and just creating. In fact, as I recall those memories, I can feel the joy of getting my first box of 64 color Crayola crayons, complete with the treasured colors of gold and silver! Now, as an expressive art facilitator, I find myself formally using and exploring the effects of making art on the healing process. Often when we think of art and artists, we generally think of the “Masters” or those who have chosen art as a profession. However, we all have a creative spirit inside us. Even if you are one to claim that you can’t draw, you can still express yourself through art. Expressive art is not about the product that is produced but rather the process. It is a way to express that moment and feelings. Art does not have to be “perfect” and within the lines or look like a photograph. Often our emotions are untidy and unruly. This should come forth in our art if we are trying to heal. Creating through art is a way in which one can connect with themselves and to process life experiences. It can provide relaxation and reduce stress offering a pathway to wellness. There are several benefits to engaging in the creative process. First and foremost it will promote relaxation and reduce stress. Through creative expression you can connect to your feelings and using your imagination will help to lessen pain and anxiety. Expressive arts can help you to process grief and trauma as well as strengthen or heighten your sense of empowerment and well-being. 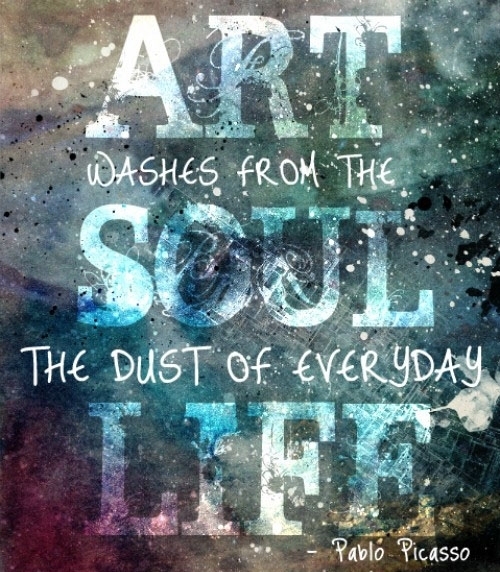 Making art can also help to connect you to your inner self to discover your sense of purpose. How exactly does engaging in the creation of art help one heal? Much research has been done on left brain and right brain processing. It has been discovered that we think and process our life experiences, feelings, and emotions as images first which makes the use of creating images a more direct manner in dealing with what may need healing. When we engage in art our autonomic nervous system will move the body into a relaxation response. When this happens our hormones will trigger a healing mode within our bodies. Immune cells will begin to receive an increased blood flow bringing them much needed nutrients as well. Stress will be reduced and in response to reduced stress we will experience less inflammation in the body. As part of my educational journey I was fortunate enough to become a Creative Coach for the Art for Healing program offered through the Integrative Medicine Department of Hartford Hospital. My role was to deliver to patients the opportunity to make art to help process their hospital visit and promote healing. I observed and learned a few things through my work as a Creative Coach. All the patients I worked with carried stress and worry. This was indicated on the evaluation form they completed at the end of their session. Every evaluation form clearly indicated that the patient’s stress level was higher before the session began as compared to after. The Art for Healing sessions made a difference. I did not need an evaluation form to validate that though. It was clear by watching their body language as well as listening to their voice. Many patients I came in contact with were either curled up in a ball on their bed, or hunched while sitting. At the end of the session, they were sitting taller and no longer curled up but were open. As we engaged in conversation the tone of the patient’s voice changed from that of being defeated or tired to one of alertness, empowerment and satisfaction. I have yet to leave a session in which the patient is not smiling and requesting another visit. I believe this helps to affirm that expressive art is an experience that will offer relaxation, stress-reduction, reduction in pain and anxiety, as well as a feeling of empowerment and well-being. A clear example of this was a patient I had the honor of working with on three separate occasions. During my last visit with her, it was very clear that she was upset. Without prompting, she informed me of her issue, which was a recent diagnosis that she had heart difficulties. This had her worried as this was not the reason she was in the hospital in the first place. We talked about how she was feeling. I asked her to tell me how she feels about her heart. What does her heart mean to her? What does it do for her? She immediately answered with phrases that had nothing to do with her diagnosis such as: my heart is love, my heart gives me strength, my heart is caring, my heart gives me life, etc. I suggested that we make a collage about her heart. This collage should embody all that she is feeling her heart represents to her. When the collage was complete, the patient was not only satisfied but her anxiety was diminished and she felt empowered. She said that when she looked at what she created, she would only think of her heart in a positive light, not as an organ that needs help. She had made an important step in healing her heart. The positive thoughts that she was now entertaining in relation to her heart will send messages to her physical body and healing will begin on that level as well. Engaging in the process of making art is a way to delve deep into yourself to discover your inner soul and life’s purpose. The images that are created come from a place deep within you giving you a window into your true feelings, emotions, and desires. One art form that can do this in a profound way is that of collage. I am fortunate to be a SoulCollage® facilitator and observe this in action at every workshop I do. During my training as a facilitator, it was quite interesting when given a short amount of time to select pictures, what I was innately drawn to. Without knowing the intended purpose behind the collage I was making, I found it to be an eye opener when asked to speak to my creations. The selected pictures were quite representative of who I am. There is merit in this type of activity, particularly with helping people see what they truly feel about themselves. Doodling, the process of drawing random squiggles and pictures, offers yet another way to connect to your inner self. Often the lines, symbols, or pictures we doodle are given to us intuitively and have meaning. Also, the actual act of doodling is meditative. One can get lost in the process bringing awareness away from the surrounding environment and into a place of inner consciousness. One form of doodling that merges meditation and creating art is Zentangle. Simple steps of drawing repeated patterns are part of the Zentangle method. These steps support relaxation, increase focus and inspiration, along with an increased sense of personal well-being. SoulCollage®, doodling and creative activities like these help an individual to look at themselves in a new way and to discover the messages of their inner self or soul. Art is a way to heal and maintain your personal well-being. It serves as a manner in which one can also connect to the soul and spirit. It doesn’t matter the artistic skill, or lack of it, since the product doesn’t matter as much as the process does. In fact, it makes no difference as to the form of art be it collage, sculpture, or sketch. What matters is the engagement in the activity and attention to what the process is doing for the mind, body and spirit. So grab some crayons, markers, pen, pencil, clay or paint and create! Discover the healing effects of the process and then look at your creation to learn more about your inner feelings, emotions, desires and life purpose. As an Expressive Art and SoulCollage® facilitator, I do offer private sessions, SoulCollage® classes and opportunities for you to experience this process. Feel free to check the following links for more information on what I have to offer you. Lisa Huppert is a gifted Psychic Medium, Usui Shiki Ryoho Reiki Healer and Master Teacher, Tibetan Bowl Sound Healer, writer, and multimedia artist. She holds a MA in Integrated Health and Healing from The Graduate Institute, a MS in Language Arts, as well as BS in Special Education & Elementary Education. Lisa is a certified Holistic Stress Management Instructor as well as a SoulCollage® facilitator.